Tom returns with a full wrap up of rounds one and two of the 2017 National Draft. Another national draft was completed on Friday night with much of the footy world watching on in anticipation. As was the case last year, I’ve been following the draftees closely again in 2017, attending games and watching as many videos as possible. I’ve combined the player bio’s off AFL.com as well as providing my own thoughts on the draftees, particularity as a fantasy option next year. With each player selected in the national draft, I’ve taken into account athletic traits, physical development, fantasy numbers and potential 2018 game-time before giving a final summary. As always, if you have a question or want to know more about a certain player, let me know in the comments and I’ll get back to you as soon as I can. Click here for rounds 3-7. Fantasy Perspective: Rayner is simply the best junior player in the country. It’s been well documented that endurance is the big weakness in Cam’s current game. Fortunately this can, and likely will be improved upon in club land, however it is no-where near good enough if he wants to progress into a genuine midfielder (2km time-trial result of 7.57 min). With a power-packed, ready-made frame, Cam is expected to play from round one next year as a medium forward, restricted to stints in the midfield. Averaged a touch under 20 disposals to go with 3.1 marks, 3.6 tackles, 2.2 goals and 86 points. Watchlist. Fantasy Perspective: The brother of Angus ended up being taken one spot higher. Andrew is one of my favourite players in the draft class. His endurance, size and ability to win it on either side make him ready-made for AFL next year. For the Dragons and Vic Metro, Brayshaw averaged 23 disposals, 3 marks, 5 tackles, 0.7 goals and 89 fantasy points. Will play round one. Fantasy Perspective: Dow is different to a few of the other inside midfielders of the draft pool (Davies-Uniacke, Bonar, Constable, D.Fogarty) in that he is of ‘average’ height. Despite this, he is the best contested-ball winner of the class and has a winning blend of both speed, burst, agility and endurance. Next year he could well be deployed on a wing or even as a rebounding, run and carry half-back where his blistering pace can be utilised. Averaged 82 fantasy points last year from an average of 22 disposals, 3.4 marks, 2.9 tackles and 0.7 goals. Fantasy Perspective: LDU certainly has the frame that will allow him to slot straight into AFL football next year. His endurance will need to be improved before becoming a full-time mid though. Davies-Uniacke has shown great ability both through the midfield and up forward and will provide North Melbourne with the flexibility to be able to play him in either position next year before becoming one of the leaders in the Kangaroos on ball brigade. Averaged 92 fantasy points across the year and will get plenty of games early. Fantasy Perspective: Cerra is a pure balanced midfielder with the ability to win it in the contest and on the outside. This ability could see him spend time on a wing next year. Has missed a massive chunk of football over the past few years but there is no doubting his ability. Cerra was the best fantasy player of the top six players, averaging 97 points from 22 disposals, 4.9 marks, 4.6 tackles and 0.9 goals per game. As with Brayshaw, the Dockers will be giving Cerra opportunities early on. Fantasy Perspective: Jaidyn’s blend of athleticism, aerial ability and speed makes him a genuine match-winner. With a few pre-seasons under his belt, Stephenson could well turn out to be a Fyfe-type inside midfielder as he is quite tall. However at this stage, his is still ‘skinny’ and won’t be a big ball winner early days. He is expected to debut next year though and will be deployed as a third-tall forward or off a wing. 80 point fantasy average for both the Eastern Ranges and Victoria Metro. The ‘Pies will be sure to monitor his heart issue closely. Fantasy Perspective: Hunter Clark is one of the more intriguing prospects. His line-breaking ability is fantastic, as is his inside game. Healthy average of 89 fantasy points for Dandenong and Victoria Country. Couldn’t have landed at a better club when it comes to game time in 2018. Won’t be the last time we hear his name. Fantasy Perspective: Coffield has had a fantastic year, rising up the ranks rapidly since the start of the year. His foot skills, speed, line-breaking and evasiveness will allow him to fit right in. His is capable of spending solid time on the wing or as a running half-back next year however his frame may allow him to become a bigger-bodied inside midfielder with time. Coffield averaged 21.4 disposals and 80 fantasy points throughout the year. Fantasy Perspective: Not often do key defenders slot straight into AFL football in their debut season, but Western Australia’s Aaron Naughton could buck that trend. His intercept marking and speed make him an ideal third-tall defender who can play the Lever-type role. WAFL numbers were solid for a KPD, finishing the year with an average of 14.8 disposals, 6.4 marks and 69 points. Fantasy Perspective: Lochie O’Brien is probably the best kicker in the draft pool which obviously appealed to the Blues, in need of some midfield class. Combination of speed and endurance are rare traits for many of the top draftees. Lochie won’t play every game, but he should feature at some stage, whether it’s off a wing or back flank where his running capacity and skills can be best utilised. Contested ball winning will need to be improved. Averaged 78 points last season. Fantasy Perspective: Bonar is another with the size to be able to play next year, however like many taken before him, Aiden’s endurance and consistency are areas requiring improvement. Like Fogarty, he is powerful but not a big ball winner, averaging 15.3 disposals, 4.3 marks, 2.8 tackles and 68 points. The Giants won’t be rushing him into anything given his troubles with serious knee injuries. Fantasy Perspective: Touted as a candidate for the number one pick earlier in the year after a super impressive 2016 season, Darcy Fogarty wasn’t able to add much to his credentials this year. Injury certainly hasn’t helped, but there was enough glimpses of the South Australian which suggests he can be a star. Although he may play some games next year, his endurance and work rate needs to be improved upon. Wasn’t a big ball winner either, only averaging 10.6 disposals and 49 fantasy points. Will be able to play next year, adding to the Grand Finalists already potent forward line. Fantasy Perspective: Brander’s stocks have dropped since the start of the year but he remains one of the best key position players in the pool. Can be used at either end but will likely learn the craft up forward next year in my opinion. Not one I would touch next year even though he could receive significant AFL exposure. Lack of tackling pressure will be worked upon. Average of 12.8, 4.8 marks and 56 points. Will offer support to Kennedy and Darling from round one. Fantasy Perspective: Before you ask, no, there is not a connection to Cameron, despite sharing the same surname and hailing from the Geelong area. Matthew is a damaging player who, much like Lochie O’Brien, uses his skills , agility and speed to good effect. The Falcons and Vic’ Country players looked for him to distribute the ball on the outside. Averaged 16 disposals, 3.3 marks, 2.7 tackles and 61 points. Will compliment the Swans big inside mids, but don’t think he’s one to watchlist at this stage. Fantasy Perspective: This year, it seems the smaller midfielder/forwards are the better fantasy players. Whilst Bailey hasn’t been as productive as Jack Higgins or Lachlan Fogarty, he will likely manage a handful of games for Brisbane in 2018. At 181cm, Zac, who boarded at Adelaide’s Prince Alfred College, played the year as an inside midfielder, but a start up forward would be a more realistic as his endurance isn’t high at this stage. Averaged 21 disposals, 2.5 marks, 3.7 tackles and 77 points. Fantasy Perspective: As either a general defender or outside midfielder. Is another who could well fit in for a few games last year. In terms of fantasy output, Richards was below the likes of Coffield, O’Brien and Constable who played similar roles, only managing and average of 58 points. Endurance also a question mark. Recruited to fill Bob Murphy’s role off the half-back line. Fantasy Perspective: If draftees were selected off pure numbers, Jack Higgins would be right at the top. He is the best fantasy player of all draftees, averaging 25 disposals, 5.7 marks, 5.7 tackles, 1.8 goals and 114 fantasy points for Metro and Oakleigh. It’s likely Jack, who quit year 12 to focus on his football, spends time as a small forward next year, perhaps with stints in the midfield. Higgins is one of, if not the best rookie fantasy prospect ahead of the 2018 season. Despite the Tigers being well stocked up forward, Higgins will still play games. Fantasy Perspective: Starcevich was the a bit of a surprise selection here. The Western Australian is a big-bodied midfielder that can play on the inside but looks better suited on the outside at this stage. His speed and agility are real strong points. But despite his strong frame, his contested ball winning and production require some work. Not a big ball winner, averaging 13.3 disposals, 2.6 marks, 3.4 tackles, 0.7 goals and 60 points throughout the year. Nice player that will add to the Lions midfield depth. Fantasy Perspective: Powell was the biggest surprise of draft night for me. He played 18 games for Claremont at colts level, averaging 14 disposals, 3 marks, 2.2 tackles and 56 fantasy points. Will need to add size over a few pre-seasons but his foot skills, speed and ability to also win the contested ball are nice traits to have. Not likely to see much game time in 2018 though. A bit about Wil Powell at the Suns: came to attention earlier in the year playing colts footy at Claremont, and is a quick, tough and skilful midfielder. He stands at 187cm and has reminded some over in WA of playing like Jack Martin. Wait for his tape. Fantasy Perspective: Despite being behind Toby Nankervis in the pecking order at Richmond, Coleman-Jones could still be used next year, likely as a key forward who can rotate through the ruck. Generally ruckmen take time but I feel CCJ could make the jump a little earlier, likely as a key forward. 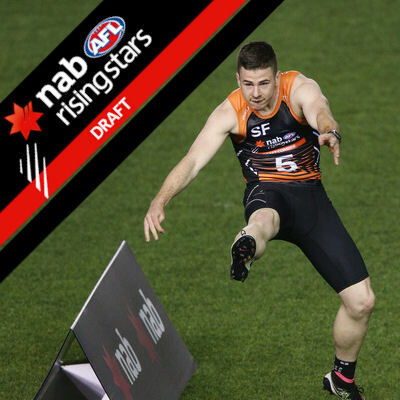 CCJ’s strength and contested marking are amongst the best in this years draft pool. His kicking technique will be refined at AFL level, but the SA big man averaged a strong 18 disposals, 5.7 marks, 1.5 tackles, 16.1 hit-outs and 88 fantasy points. Fantasy Perspective: Allen really fired during the championships for WA as an undersized key forward. His performances this year have been exceptional. His size will never really allow him to become an out-and-out key forward, however his leap, athleticism and mobility make up for this awkward size. Could even push up onto a wing with his strong endurance base. Fantasy Perspective: I rate Lachlan Fogarty higher than many other draft watchers. He is simply a very good all-round midfielder. And in terms of fantasy, with a final average of 111, there aren’t many better. He averaged 22 disposals and 3.1 marks but it’s his tackling (average of 9.5) and scoreboard impact (1.1 goals) that really inflates his fantasy potential. Not tall by any means but I’m hoping he debuts next year as his fantasy potential is high. Geelong may use him up forward. Fantasy Perspective: The Kangaroos went early on Walker, who has a high potential with a mix of size, speed, agility and stoppage work. He is still 6-8kg off his optimal playing weight and will require a few seasons in the gym. Was a good ball winner at TAC Cup level, averaging 20 disposals, 4.3 marks, 4.4 tackles, 0.9 goals and 88 points. Fantasy Perspective: The Western Australian is the first mature-ager to be taken as he heads to the cattery. Tim Kelly is the most fantasy-relevant player for next year in my opinion. Averaged 101 points at WAFL level from 26 disposals, 4.2 marks, 3.6 tackles and 1.1 goals. A smooth-mover, Kelly is good around stoppages and has been compared to Wells with his class and inside/outside balance. May be used as an outside midfielder or half-forward next year where he can rotate with GAJ. Jot this name down. Fantasy Perspective: Generally super-athletic key position players are skinny and require a few sessions in the gym before being able to play AFL. However this is not the case with Noah who is already solidly built at 195cm and 95kg. His consistency and decision making will need to be worked on. Balta isn’t one I’d consider for next season, having averaged 12 touches, 3.6 marks, 2.9 tackles and 64 points, but he could play games as a forward alongside Riewoldt. Fantasy Perspective: It’s taken a bit longer than he would’ve liked, but finally Liam Ryan has made it onto an AFL list. The 21-year-old is one of the most talented small forwards in the country and last year, was the WAFL’s leading goal-kicker. Last year his WAFL fantasy average reached 75 points, largely due to his average of 3.1 goals per game. He won’t be doing that at the highest level, however Ryan will slot straight into the Eagles side. Fantasy Perspective: Brent Daniel’s averaged 20.6 disposals, 3.3 marks, 3.3 tackles, 1.9 goals and 85 points per game for the Pioneers and Victoria Country. He has played as a small forward and inside midfielder, using his speed and agility. Despite smaller players becoming more and more ‘accepted’, I am still of the belief that his frame is just too small for a midfield role. As a forward though, he could thrive for the Giants, replacing the departed Devon Smith. Definitely fantasy relevant next year. Fantasy Perspective: Taylor is a lock-down key defender who worked well in tandem with the more intercept-orientated Aaron Naughton for WA. He managed to play a handful of WAFL league games for Swan Districts which suggests he is already well developed physically. Averaged 65 fantasy points from 14 disposals, 5 marks and 3.6 tackles. Will be behind the likes of Davis, Tomlinson and Corr but is ready if required. Fantasy Perspective: There’s a lot to love about Charlie Spargo’s game. Unfortunately we didn’t see enough of it this year as injury struck. Despite his size, Charlie’s dedication, on-field aggression and football smarts make him one guy I’d back in to succeed at AFL-level. I like him more as a midfielder but would start as a small forward. Scored 83 points in his lone Under-18 Championships game. Adds much needed speed to the Dees midfield. Fantasy Perspective: De Koning is another key position player who will need time. He’ll spend the year at Carlton’s affiliate side the Northern Blues, developing his contested marking. There he can be utilised down back, up forward and through the ruck. Averaged 10 disposals, 3.1 marks, 2.4 tackles, 14.2 hit-outs, 1.1 goals and 65 fantasy points last season. Fantasy Perspective: The 21 year-old Fritsch is still skinny and will have to add kg’s to his frame before the Dees unleash him. However he added 10kg’s last year and is . Kicked 44 goals in 19 matches for the Demons last year, proving his all-important ability to hit the scoreboard. His prowess in the air is elite and will provide Melbourne with an option up forward in about a couple of seasons time. Wouldn’t have though he’d be all that fantasy relevant in 2018 though. Fantasy Perspective: Ainsworth is one for the watchlist. Playing 23 games, Brayden averaged 22.8 disposals, 4.6 marks, 3.8 tackles, 0.6 goals and 91 fantasy points. Spent time in the WAFL colts and reserves for Subiaco. He’ll fit in nicely at the Eagles where he will probably play some senior football next year. Fantasy Perspective: McCartin is an extremely athletic key forward whose endurance allows him to get up the ground, rather than staying in the forward 50. This trait is handy in terms of fantasy. However for a key forward, he only managed an average of 0.3 goals per game for the Falcons and Victoria Country. He managed an average of 9.1 disposals, 4.4 marks, 1.8 tackles and 46 fantasy points. Will add to Sydney’s tall forward depth. Fantasy Perspective: Not a bad time for Patty Naish to join the Tigers. However he won’t be featuring often, if at all, next year. He is still very skinny and there are a few others well ahead of him at this stage. Averaged a healthy 83 fantasy points which suggests he has fantasy potential. Averaged 20 disposals, 4.4 marks, 2.9 tackles and just over a goal a game for the Knights and Victoria Metro. Started playing together when they were 15. Fantasy Perspective: Clavarino’s stocks have dropped since the start of the year, but he remains a solid defensive prospect. His speed and strength are areas of improvement. Will join Stingrays teammate Hunter Clark and provide the Saints with all-important key position depth. May be called upon for a debut later in the year. Fantasy Perspective: Charlie Constable is much better than pick 36 suggests. His versatility will give the Cats the option to play him almost anywhere. Yet another who has a bigger frame, allowing him to feature prominently next season. His kick:handball ratio isn’t great for fantasy (average of 8.9 kicks and 14.9 handballs) but, nevertheless, Constable was a productive player, averaging 89 points. Geelong could use him in a variety of positions next year. Definitely one to watch. Fantasy Perspective: Petty has come from the clouds to be one of the draft pool’s best key defenders. His intercept marking and foot skills, combined with a lack of strength just yet, could allow him to start off as a third-tall defender. Numbers (15.7 disposals, 7.2 marks, 2.6 tackles and 74 points) were good for a key position player. Could allow Tom McDonald to spend more time up forward. Fantasy Perspective: Petruccelle has pace, real pace. His leap, overhead marking and ability to win the contested ball make him a lucrative selection for the Eagles. Jack’s foot skills and endurance needs improvement which will restrict him next year. Could still play some games though. Production was relatively low for an inside midfielder, averaging 12.4 disposals, 2.7 marks, 3.3 tackles and 57 points. *Each players statistics have been compiled from different leagues around the country and combined to produce the players overall average stats. Average fantasy points do not take into account free kicks or behinds. The brother of Angus, although he wasn’t taken as high, could well end up becoming the better player. Last time I checked I thought Angus went 3 ? Super hyped to have some viable Geelong options next year.. all 4 could potentially see game time. Many thanks for all that work ! Yep, Geelong drafted very well! Fantastic summary, mate. Love your (hard) work. LDU seems most likely for Round 1 for me. He’s my tip for the rising star. Think all of the top midfielders (Brayshaw, Cerra, Dow, LDU, Clark) will play lots of games next year.